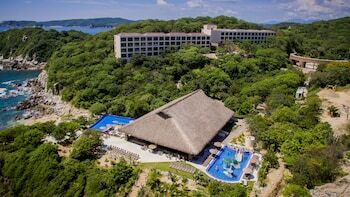 Located in Huatulco, Isla Natura Beach Huatulco is within a 10-minute drive of Marina Chahue and Huatulco Beach. Featured amenities include a 24-hour front desk, luggage storage, and a safe deposit box at the front desk. Event facilities at this hotel consist of a conference center and a meeting room. Free self parking is available onsite. Located in Veracruz (Malecon), Hotel Santander is within a 5-minute walk of Veracruz Cathedral and Naval Historical Museum. Self parking (subject to charges) is available onsite. When you stay at Casa de Aves in San Miguel de Allende, you'll be on a lake and 14 minutes by car from Sanctuary of Atotonilco. Free self parking is available onsite. With a stay at Hotel Tonancalli in Valle de Bravo, you'll be within a 5-minute walk of Artisan Market and Saint Francis of Assisi Church. With a stay at Villa Ventana by RedAwning in Puerto Vallarta (Romantic Zone), you'll be minutes from Playa de los Muertos and close to Malecon. With a stay at Hotel Condesa Americana Acapulco in Acapulco (Costera Acapulco), you'll be within a 5-minute walk of Icacos Beach and Condesa Beach. With a stay at LA CASA DEL GATO in Cancun (Downtown Cancun), you'll be within a 5-minute walk of Cristo Rey Church and Las Palapas Park.